Want to get a new look quickly and affordably? 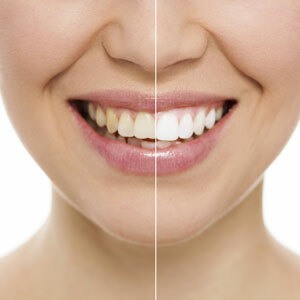 Improve your smile with simple, noninvasive tooth whitening procedure at Shine Dentists, Franklin. One of the most popular cosmetic services, it can be done by the dentist or in the comfort of your home. Enamel is the material that makes up the outer surface of your teeth. It has microscopic holes where everyday stains can become trapped. By using a tooth whitening gel, the holes can be penetrated to remove stains and lighten teeth. At your whitening consultation, your dentists will examine your teeth and gums and make a recommendation on which option would be best for you. Please note that only natural teeth can be whitened, meaning crowns, bridges, dentures or implants won’t be affected. The degree of whitening achieved will vary, and more discolouration means you will take longer to respond. Remember that it’s not permanent, but can be repeated every 12-18 months. With this option, your gums are protected by a rubber coating, then the gel is applied to teeth. It works on contact and is further activated with a laser light. Each of our whitening kits contains custom-made trays along with a gel. It can be used for up to 15 days until you reach the desired level of whitening. The trays are created by taking an impression of your teeth, which is then sent to a dental laboratory to fabricate you trays. When you receive them, simply apply the gel and wear the trays. Schedule your appointment today to discuss which of our solutions is right for you! Early and late hours are available.